Amaze your loved ones by gifting them this Arresting Funskool Game of Go and make them crave for more. This strategic war Game is ideal for the kids above the age of 10 years which helps in curiosity building, social skills and problem solving. 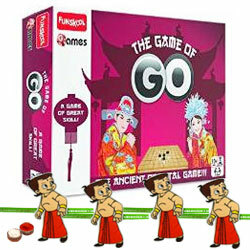 This game improves the concentration of both the players with 4 Chota Bheem Rakhi and Roli Tilak Chawal.